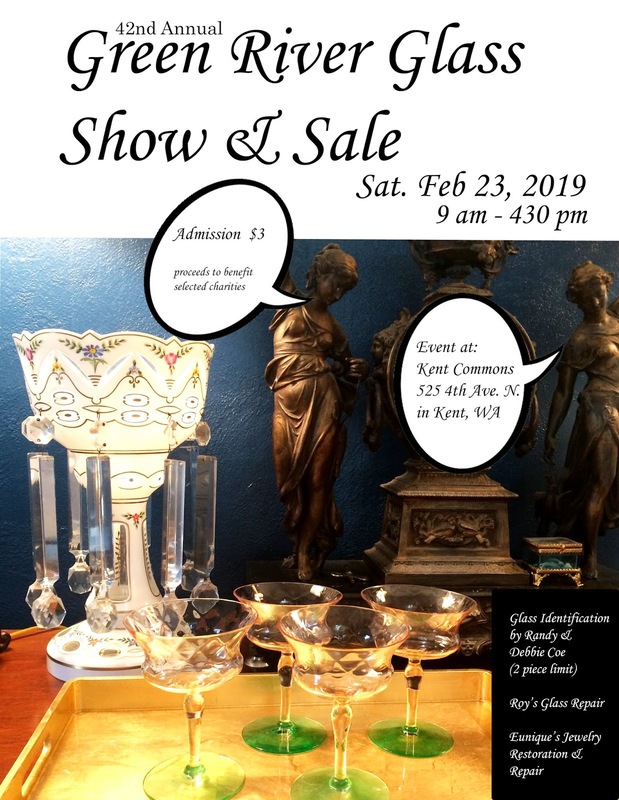 In its 42nd year, the Green River Glass Show and Sale is taking place on Saturday, February 23, 2019, from 9am until 4:30pm at the Kent Commons 525 4th Avenue N., Kent 98032. There is a lot of parking, and a sea of colorful glass and pottery from eras long ago. If you are looking for a match for your family's pattern, want to find something special that will remind you of your younger years, or just want to get out and find something different to do... this is an event that might interest you! Have a piece of glass or pottery that you are unsure of? There will be special guests Randy and Debbie Coe during the event (with a two piece limit) to give glass identification. Did your favorite vase or goblet get chipped over the holidays? Roy's Glass Repair will be on hand to offer his services (prices vary for item to be fixed). Was there a stone missing from your necklace after you attended that wild Christmas neighborhood party? Eunique's Jewelry Restoration and Repair will also be at the event. Admission is $3, with proceeds benefiting selected charities.